Laying mats in preparation for the Friday prayers in Mohamad al-Talawi Mosque in Qanawat. Before entering a mosque, Muslims take their shoes off, out of respect to the house of God. Pardon my ignorance ... I'm going to hazard a guess and say that this mosque hails from the Mamluk period. Am I right? Yeah I guess it's from Mamluk period too. I'm interested to know how praktike, sinan and others can tell just from looking at the photo that the mosque is probably from the Mamluk preiod and not from the Ummayad or Ottoman periods. I would be grateful if anybody could tell me what FEATURES there are in the photo that made them reach this conclusion! Many thanks for you help! Yes the alternating white and black stone stripes is one of the clues, and the name of the mosque too, I think that Al-Talawi is the name of a sheikh during the Mamluk period but I am not sure though. Very interesting discussion. 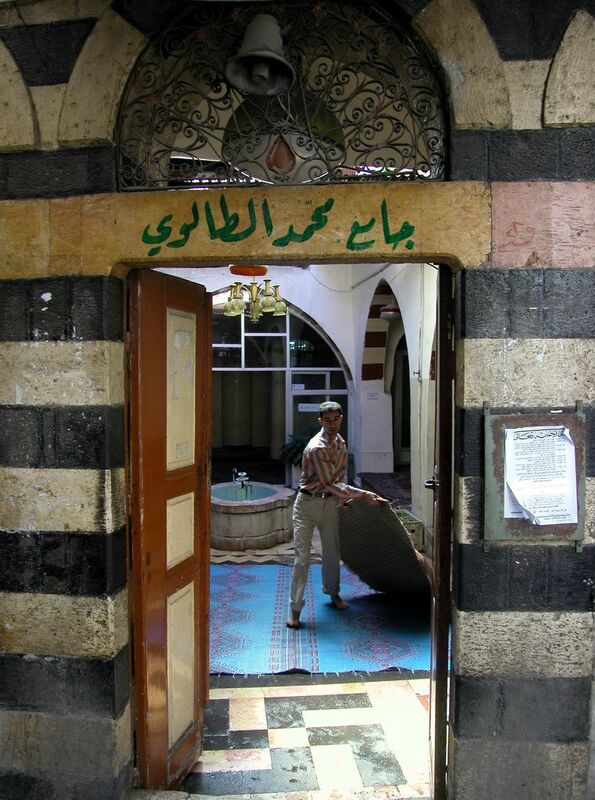 But most of the Mosques in Sham have these black and white stripes, especially in the Old City. Does that mean they're all mamaluk mosques? It's right that the alternating white and black stripes were first introduced by the Memluks. However, the stripes have been a major element in Damascene architecture ever since, and they were used in many houses and mosques during the Ottoman period. The stripes are not enough to say that this Mosque is Memluk. I think it was built during the Ottoman era, but I am not sure. I will have to find out more about the Mosque and look up who Mohamad Altalawi was. The bricks looked old to me, which is why I thought (in addition to the stripes) that it was Mamluk (1250-1517). I couldn't find out anything about Mohamad Altalawi, though. But maybe Qanawat is too recently built? Did the area even exist during the Mamluk era? I couldn't get information on Mohammad al-Talawi, but it says on the mosque's entrance that it was built in the Hijri year 1301, which is 1883 A.D. That means that the mosque is relatively new and belongs to the late Ottoman era.